"What is a root canal?" First of all Dr. Strong always makes sure his patients are numb when they have a root canal procedure. He recommends the nitrous(laughing gas) and he is efficient. That means less time in the chair for your, while still achieving a great result. If you need a root canal, and you live in the Spanish Fork area (that includes Springville to Nephi, even Price) give Dr. Strong a try. You will not regret it. Root Canals get a very bad rap. How many times have you heard someone say, "I'd rather be getting a root canal!" Hopefully we can change the way root canals are perceived in the future. Root canals are just like any other filling, except they are a little bigger and a bit deeper (down into the roots). In the past the anesthetics used were not as good at getting infected teeth numb. It was not uncommon for the dentist to have to start the root canal while your tooth was still not completely numb. Once the tooth was open the dentist could put some anesthetic directly into the nerve (which also was not very comfortable) and you would finally be numb. That was a "white knuckling" experience to say the least. Now we have better ways of getting you numb. Another thing to consider is if you are having a toothache a root canal is your best friend. It will get you out of pain. By removing the nerve, or the infected tissue from the tooth, the pain usually diminishes significantly. It is a common misconception that the entire root is removed. Not really, only the soft tissues inside the root are removed during a root canal. The hard tissue (the actual root) is left in place and continues to function as it has prior to the root canal treatment. Getting that soft tissue out is the way we get the bacteria causing the infection out. Also, many people choose to extract their tooth because they just can't afford to pay for a root canal. That is one of the big reasons we have put payment plans into our office. In the end, it is up to you, whether you want to save or pull your teeth. After all they are your teeth. We just want to make sure you understand all your options. The success rates on root canals is very good. Between 90-95% success. There are very few things in this world with such excellent success rates. It does happen that root canals fail. 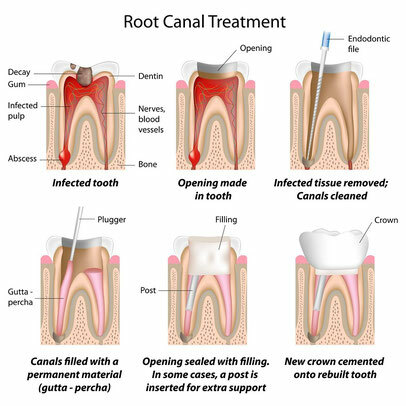 When a root canal fails it is usually within the first 6 months, or after ten years. So if you have a root canal, and it has been longer than 6 months, the odds are in your favor. One of the most important factors in root canal success is whether or not you have a crown placed on the tooth. The crown "Seals the deal". It keeps bacteria from re-infecting the tooth from the top of the tooth. It also protects the tooth from splitting in half. There are many myths out there about root canals. These myths seem to cycle every few years through facebook and other alternative medicine outlets. You can review some of these myths HERE at the American Academy of Endodontics. The bottom line is, when root canals are done properly, they are very SAFE. It is better to save YOUR tooth, the one your body made in the first place. Dr. Strong enjoys root canals. They are like little puzzles that have to be methodically figured out and taken apart. He has taken a lot of continuing education to get better at root canals. It is one of his favorite parts of dentistry. If you need a root canal, you can trust Dr. Strong to do a good job. Quit putting off that root canal. They are not as bad as everyone says.